The Bloody Elbow team has submitted its predictions for UFC 231, and while everyone who wrote something up picked Max Holloway over Brian Ortega, overall opinion is fairly divided. As for the co-main event, again things are split as to who will prevail between Joanna Jedrzejczyk and Valentina Shevchenko. It’s good to have toss-up title fights such as these two, isn’t it? Anton Tabuena: This is pretty straightforward to me. Barring any weird health issues, Max Holloway should completely run through Ortega here. Holloway is just better and far more dangerous than all the other people Ortega has beaten. This is obviously still MMA and Ortega has shown that he has decent power, but he definitely won’t pick apart someone as technically proficient as Holloway. I think this will look a lot like Ortega’s past bouts, but he’ll take a far worse beating and won’t be able to secure that miracle comeback. Max Holloway by TKO. Mookie Alexander: There’s a level of unsustainability to Ortega’s love of finishing fights over winning rounds, and Holloway is a masterful round winner. I am obviously assuming we’re getting the best version of Max Holloway, so that’s the key here. Ortega has grown tremendously as a striker, but up until this point, Holloway has shown a ridiculous chin and he’s probably not the person you want to engage in a high-paced brawl with. Ortega loves the jumping guillotine, I suspect Holloway will be ready for that, and he’s a damn good grappler in his own right. Takedowns are unlikely on either side, and Ortega in particular has shown himself to be not particularly good at taking his opponents down in the first place. 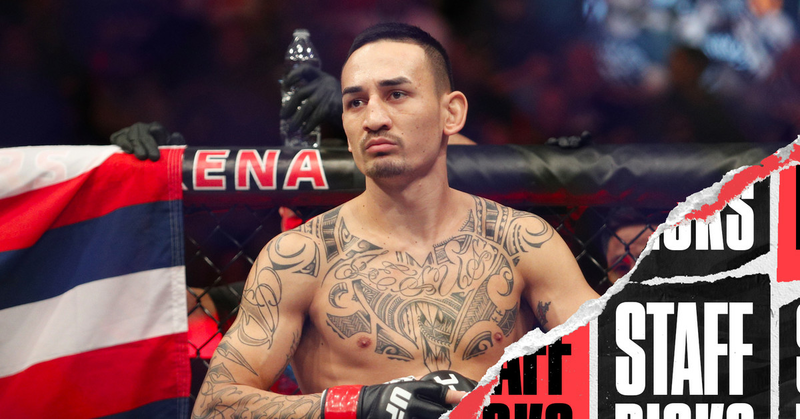 While Ortega is extremely dangerous based on what we’ve seen from him in recent fights, I still trust Holloway to do more damage and avoid the classic Ortega comeback. Max Holloway by unanimous decision. Zane Simon: Ortega’s fight against Frankie Edgar was something of a revelation. He’s always been tricky, always been dangerous, but that was the first time that his striking style – built around a lot slicker moves and often a lack of fundamental ones – has looked like a complete game. He worked behind the jab, feinted, drew out predictable answers and changed up his entries to club Frankie into unconsciousness. It was damn pretty. It also means that it’s hard to say how much more improved Ortega might be now. Without seeing more variety and consistency to his game, and without seeing an ability to maintain output over multiple hard striking rounds, I have to pick Holloway. His ability to push a pace and then to up that pace as his opponents tire, his ability to change targets in combination and open up new combinations off earlier, simpler ones, just aren’t skills that Ortega has shown yet. And Ortega still has a history of losing rounds he hasn’t finished the fight in. Even with Max’s health scare, most of the questions are on Ortega’s side and most of the answers are on Holloway’s. Max Holloway by decision. Victor Rodriguez: Neither guy is going to be looking to take the other down, and Holloway’s clinch game is lethal. Having said that, Ortega’s been a guy I’ve counted out in so many fights, I just feel stupid picking against him. He should have a range disadvantage and Max’s frenetic pace should make this difficult for him due to volume, but Ortega doesn’t get hit that much and seems to keep finding ways to pull a rabbit out of his hat. I still want to pick Ortega by diving for a flying armbar from a clinch situation, but that’s a little reckless even for me. And while I’m still worried about the fact that we still don’t know what health concerns Holloway had last time, it seems that the guy that wears damage well and has a more complete and composed approach to his strikes should be able to take over as the fight goes on and apply pressure accordingly. Max Holloway by decision. Anton Tabuena: Even if you don’t put much weight on all the wins Shevchenko has had over Joanna in Muay Thai, it’s still very hard not to pick Valentina here. They know what each other brings to the table, and they’re likely to still keep this standing for the most part. They’re both very technical strikers, but Shevchenko is bigger and has dealt with harder hitters, while Joanna relatively takes a lot more heavy shots and gets clipped more often. While Shevchenko isn’t really a big KO hitter, smaller fighters with a similar reputation have hurt and dropped Joanna, who seems a bit shopworn already. Valentina Shevchenko by TKO. Mookie Alexander: I feel like Shevchenko’s reputation exceeds her actual in-cage results. She quite clearly lost to Amanda Nunes the first time but I reckon most remember the final round. Even with the dominant win vs. Holly Holm she suffered an early knockdown. As awesome as the Pena win was, the Nunes rematch was terrible and she has herself to blame for not getting the nod. Priscila Cachoeira was a gross mismatch and arguably has no bearing on how a fight with Joanna would play out. I feel like the best way to beat Jedrzejczyk in an MMA fight, or at least be competitive, is to match her volume and pace. At least at strawweight, we’ve seen Joanna’s takedown defense as exemplary, and Shevchenko relies heavily on clinches to get people down, and Joanna isn’t easy to hold down. Shevchenko also isn’t a fantastic finisher or powerful striker, and her lack of consistent minute-to-minute output and willingness to counter almost all the time could swing close rounds Joanna’s way. The best case scenario for Shevchenko is she is strong, fast, and athletic enough to work Joanna over, and have the power to hurt her on the feet or dominate her on the ground. I don’t think this happens. Joanna Jedrzejczyk by unanimous decision. Zane Simon: I’m not picking up what people are putting down about Valentina Shevchenko. She’s careful, technical, and a much better wrestler than the standard of her division. But, she’s often still a pretty simplistic, nuts and bolts fighter in the moment, who doesn’t seem all that comfortable throwing in combination at distance and uses the clinch and takedowns as a safety valve against prolonged pocket exchanges. In Joanna’s worst round against Rose, in their rematch, she landed more strikes than Shevchenko did in her best one against Holm. She’s got exceptional takedown defense and Shevchenko is really more of a clinch takedown threat than anything else. Without any kind of consistent KO threat from Shevchenko the bet would have to be that she’s just so monstrously powerful that she manhandles Joanna and grinds away at her or hurts her consistently. I don’t see it. It’s just not who Shevchenko has been. Joanna Jedrzejczyk by decision. Victor Rodriguez: For starters, don’t put that much stock into their previous bouts. It was in another environment, and it was eons ago. Second, I have to agree with Zane (yuck) – Joanna’s combinations and volume are more favorable to the judges. Joanna’s got a better sense of combining her leg kicks and punches to slow Valentina down, and adequate defense for Valentina’s style of striking. Not that there isn’t any depth to Valentina’s game, it’s just not as varied. Playing the counter game against Joanna may be riskier these days than it was when they fought years ago. Joanna Jedrzejczyk by decision. Mookie Alexander: Oliveira is freakishly strong, absurdly powerful, and can easily dent Nelson’s chin knowing how bad Gunni’s striking defense is. The thing is, Oliveira’s striking defense is somehow worse, and that opens the door for Nelson to potentially repeat to Oliveira what he did to Alan Jouban. If this becomes a brawl, Nelson is screwed because he’s just simply outgunned. However, for as strong as Oliveira may be, he’s not outgrappling Nelson, and Gunnar is crafty enough to figure out how to get this to the mat (assuming he’s not a shadow of himself after a long layoff). Tough call, but I go with Gunnar Nelson by submission, round 2. Phil Mackenzie: One of the things about being a murderous strike-to-submission threat is that it’s something which is tricky to solve with pure athleticism. Cowboy Oliveira has built himself a broader game over time, with more takedowns and subs, but it’s still pretty rough and ready and generally reliant on him physically overpowering the opponent. The other Cowboy took him down and tapped him out without much issue, and while it seems unlikely that Nelson can win a decision against him, I don’t think I trust Oliveira to get out of the first round without getting club’n’subbed. Gunnar Nelson by submission, round 1. Zane Simon: Neither guy is any kind of defensive master standing, and both have been shockingly dangerous punchers. But they’ve also both been tough to hurt, generally. The big difference is all about the grappling, mostly that Oliveira can’t stop himself from doing it, and that Nelson is much better at it than the Brazilian ‘Cowboy’. At some point it feels fairly certain that this fight hits the floor, either because Oliveira decides to try it or because he backs himself into a place where Nelson can get him down. And when it does, I gotta take Gunnar Nelson by submission, Round 2. Victor Rodriguez: Cowboy’s another guy I’ve kind of been “meh” about, but he’s undoubtedly become a force at 170. Nelson’s an otherworldly grappler, but fights start standing. I gotta side with the guy that has a Muay Thai base over the Karate-based striker 9 times out of 10, and Brazilian Cowboy has enough gunpowder to shut off Gunnar’s lights. Cowboy Oliveira by TKO. Mookie Alexander: Going with the upset pick here. Still hard to get a read on Dawodu’s UFC prospects given the shocking debut loss and then the pretty comfortable win against Austin Arnett. Bochniak is a good step up incompetition and he showed insane toughness against Zabit Magomedsharipov and made it more competitive than many had imagined. I like Bochniak’s more well-rounded game to win out here. Kyle Bochniak by unanimous decision. Zane Simon: Dawodu is undoubtedly a more technical striker than Bochniak, and I’m not sure that Bochniak has the pure wrestling to get Dawodu down and keep him there. But, I’m still picking Bochniak to win. The Bostonian has showed a surprising tactical awareness in his recent bouts. One that let him take a solid win over Brandon Davis and make his bout with Zabit Magomedsharipov a shockingly close war. He pressured when he needed to pressure, he stuck and moved and pot shotted when he needed to do that. And, he proved that he was tough as hell to hurt along the way. Dawodu on the other hand, has shown a troubling tendency to lean on slick movement and counter-punching in situations where more caution would likely serve him better. He especially has a nasty habit of trying to time very difficult counters right out of the gate, without a sense of how fast or strong his opponent is. Against the fairly anemic Austin Arnett, it worked well. Against a wildly aggressive Danny Henry, it got him club-n-subbed immediately. If Bochniak comes out fast and stays on Dawodu and maybe even eats a few early counters, I think he can land the shots to put him away. Kyle Bochniak by TKO, Round 1. Phil Mackenzie: Gotta mirror Zane’s thoughts here. The thing which impresses the most about Bochiak recently is his ability to tune his game for the opponent: fighting with aggression against Magomedsharipov, and countering against the slightly plodding Davis. This seems like another one where Bochniak will be looking to draw the aggressive fighter forward onto takedowns. Kyle Bochniak by unanimous decision. Victor Rodriguez: I’m disappointed, because after all this time in which I really wanted Dawodu to come to the UFC, he’s being given a fight like this against a guy that’s a very rugged wrestleboxer with good fight IQ. I’ll go with the sentimental pick, not because I don’t like Bochniak, but because I believe in Hakeem. Hakeem Dawodu by TKO. Mookie Alexander: Manuwa is a glass cannon who’s physically declined. Santos is a glass cannon with better, more powerful striking and might finally be at his ideal weight class. I think Santos hurts Manuwa first and then that’s a wrap from there. Thiago Santos by head kick KO, round 1. Phil Mackenzie: This should be great silly fun. Jimi Manuwa has looked a little like he’s on the downslope lately: he’s never had the greatest chin or the fastest footspeed, but the Blachowicz fight showed two men on very different trajectories. Santos is similarly frail, but again he just looks like he’s found his weight class. In particular he looked impressively tireless against Kevin Holland. Pace, youth, coming from a better division, Thiago Santos by TKO, round 1. Zane Simon: Santos is more dynamic and unpredictable in middle distances where Manuwa has a tendency to wait on opponents. And he’s more likely to swing wild in the pocket rather than look for ways to break the action and reset. Without either man being a truly dominant wrestler or grappler those are enough to have me picking Santos. But if Manuwa can stay in his face and throw tight punches in the pocket, Santos’ chin will be there. Thiago Santos via KO round 1. Victor Rodriguez: So, Manuwa’s got the power to put Santos out, but he’s gotta land first. And Santos has a more diverse striking base and better handspeed. If Anders couldn’t finish Santos in that absolute war, I don’t know how Jimi does. Not that he can’t, it’s just gonna be a hard day at the office for him. Sticking for the meaner of the two. Thiago Santos by TKO. Mookie Alexander: Something tells me we’re watching the end of Gadelha’s prime, but not to the point where I think she’ll be outstruck and unable to outgrapple or outwrestle Ansaroff. Nina has shown some significant strides in her game, but Gadelha is still the more complete fighter and is likely to be more effective offensively. Claudia Gadelha by unanimous decision. Phil Mackenzie: A tricky one. Gadelha has not inspired confidence lately, and meanwhile Ansaroff has just steadily been getting better. With that being said, Ansaroff is still too happy playing guard for my liking, and Gadelha remains one of the best pure takedown and top position players in the division. Claudia Gadelha by unanimous decision. Zane Simon: Gadelha’s gas tank is a worry, as is her tendency to leap into the pocket swinging wide. But while she’s obviously improved, Ansaroff still tends to panic a bit on takedowns, especially early in fights. If Gadelha can get her down and get her back early, she can very likely catch her neck too. Claudia Gadelha by submission round 1. Victor Rodriguez: Ansaroff hit a rough patch and has turned things around to go on a 3-2 UFC run, and deserves recognition for her improvements. She’s still facing one of the few that can be considered elite in her division, with good striking and grappling. This goes to the more battle-tested of the two. Claudia Gadelha by TKO, round 2. Mookie Alexander: HUT HUT HUT HUT HUT. Katlyn Chookagian by split decision. Phil Mackenzie: Jessica Eye has won two fights in a row, and actually looked like a composed veteran in her fight with her fellow Jess. This fight is going to be close and probably not terribly good as Eye will land higher quality shots and Chookagian will land (and throw) more. Katlyn Chookagian by split decision. Zane Simon: Eye can win this fight. She seems like the stronger fighter and has great flashes of technique. But everything comes in flashes for her and she often seems to get overly locked in on specific parts of a fight without seeing the whole thing. Neither Chookagian nor Eye have been all that dominant in recent wins, but with Chookagian I feel like I know exactly what she’s going to be doing each round and how, and why. Mostly it involves a lot of volume and jab-cross combos. If Eye can’t consistently derail that, I can’t pick her to win. Katlyn Chookagian by decision. Victor Rodriguez: For all the praise that Eye used to get for her boxing, I never really quite saw it. She’s good with volume and walking down her opponent, but Chookagian’s got some good kickboxing tricks up her sleeve with a measured counter game. Eye has a tendency to try to brawl it out and rely on her physical attributes, but Katlyn is all business. We’re probably gonna see another WMMA showcase due to the disparity in striking styles, and that could be a ton of fun. Katlyn Chookagian by decision. Phil Mackenzie: Another fight which is probably more “interesting” than it is likely to be “good”. Eryk Anders looked a little confused by the weirdness of Tim Williams in his last fight, so there’s a big chance that Theodorou can dance around him and land flicking kicks and generally just try and put rounds in the bank as sparring sessions. That being said, Anders managed to have a very competitive range kickboxing bout with Lyoto Machida, so I have a small amount of faith in him to win against an ugly conservative distance style. Eryk Anders by unanimous decision. Zane Simon: Really not happy about picking this fight. It feels insanely difficult to see the easy win for either fighter. Theodorou has all the advantages in volume, but Anders has all the advantages in power. I also worry about Theodorou’s grinding win over Trevor Smith. It seemed like the hardest way to fight Smith, even if he ended up on the right side of it. If he decides he wants to take on Anders in an “action” fight, Anders is way too powerful a counter-puncher for the kind of strikes Theodorou likes to throw. On the other hand, I think Tim Williams might have beat Anders if he’d stayed conscious for another few seconds. I just don’t trust Anders’ lack of volume and a “near win” against Lyoto Machida is starting to look more and more like a knock on Machida’s own severe lack of volume these days than it is like Anders being an immediate super-prospect. Assuming Theodorou stays elusive and kicks a lot, Elias Theodorou by decision. Victor Rodriguez: Anders’ approach seems like something Theodorou can exploit. Not easily, but at least with a healthy amount of range strikes and takedown defense leading to clinch opportunities. Elias’ cardio is also a major asset here, and his experience should prepare him for facing a guy like Anders. It’s hard to be 100% confident about picking either guy, and yet it seems like Theodorou and his team can gameplan around this and have more success than Anders bumrushing and going ham. Elias Theodorou by decision. Phil Mackenzie: Should be a ton of fun this one. I’m not sure how much I trust OAM to win in a fight where he’s not the superior grappler. Do I really think he’s going to outkickbox Burns for three rounds? Even if he’s in trouble, Burns will still wade forward throwing hard shots. I still remember that Carlos Diego Ferreira fight, where I picked OAM only to be reminded of the difference between a good MMA grappler and a very good MMA grappler, and Burns is a good deal better than Ferreira on the mat. Gilbert Burns by unanimous decision. Zane Simon: Another fight I’m really not finding an easy pick for. OAM, to date, is the tougher fighter than Burns, and the better wrestler. That alone has me feeling like he could do what Prazeres did to just kind of grind on him and plug him in exchanges. But, otherwise Burns is just a much more technically gifted, fluid fighter than OAM. OAM has some decent timing standing, but his wonky form and lack of combinations have left him without much of a KO threat, and his ability to get backed down and thrown off his game is worrying. If Burns can keep the pressure on OAM, can OAM KO him? And if he can’t KO him, can he safely take him down and stay out of submissions? My guess is no to both. Gilbert Burns by decision. Victor Rodriguez: You gonna ask me to pick against Durinho this close to Christmas? Nah, son. Gilbert Burns by submission. Phil Mackenzie: Brad Katona seems reasonably well-rounded but that tends to be an issue when you’re coming off the EU regional scene. Lopez losing to quality technicians like Assuncao and Perez has perhaps obscured how he’s still an aggressive athlete with a strong wrestling base. Matthew Lopez by unanimous decision. Zane Simon: I’m just not impressed by the past couple of recent TUF classes. Katona at least looks like a very good athlete, but is sort of okay at everything without being great at anything. And that’s especially troubling given that he’s also a low-volume striker and isn’t working with a camp notable for their fantastic technical development. Lopez is wild, to a fault, but he’s a very good wrestler and back-take artist, and a very aggressive striker. Maybe he makes a big mistake and Katona jumps on it. Maybe he fades badly down the stretch and Katona wins late. But, I think Lopez comes out strong early and makes a statement. And I don’t trust Katona to have the depth in his game to fight his way back to a win. Matthew Lopez by decision. Phil Mackenzie: Along with Reyes, Rakic is the prospect at Light Heavyweight, and frankly looks like he might even be… slightly better than Reyes? Heresy perhaps, but he has functional high-volume kickboxing, and is a willing and capable wrestler. Clark is athletic and slowly improving, but unless he can pick up takedowns I’m not sure how he wins this one. Aleksandar Rakic by submission, round 3. Zane Simon: For all the harder fights to pick, this one seems pretty easy. Clark is big and strong, but prone to gassing and lacks a lot of clean technique anywhere (as shown by getting bulldog choked). Rakic is the better striker and seems to be an equal wrestler and grappler with a much more calm, controlled, and persistent style. Aleksandar Rakic via TKO, round 2. Mookie Alexander: Lima’s bad chin and lackluster takedown defense is a recipe for disaster against someone like Laprise. Chad Laprise by TKO, round 1. Phil Mackenzie: Dhiego is not his brother, in that he has all of Douglas’ flaws (takedown defense) and a bunch of other ones as well, primarily a papier mache chin and less overall dynamism. Chad Laprise by TKO, round 2. Zane Simon: I don’t know, Lima just doesn’t seem very good at this, at least not at this level. Chad Laprise via decision. Phil Mackenzie: Nelson is stepping in on very short notice. He’s a tall, rangy striker who likes to stay mobile and hit takedowns, while relying on his toughness to insulate him from return fire. Somewhere between Neil Magny and James Vick basically, but not as good as either one. Ferreira is not unhittable and somewhat wild, but he has good enough instincts to just wallop Nelson as he tries to circle and jab. Carlos Diego Ferreira by submission, round 1. Zane Simon: Ferreira’s blend of relentless aggression and high level grappling make him a very difficult opponent to prepare for, especially on short notice. And doubly so for a somewhat classic wrestle-boxer who tends to throw himself into the pocket (and into oncoming strikes). Carlos Diego Ferreira via sub, Round 1.
Who wins the two title fights?